Originating in Thomas Cowper's 1785 poem The Task 'The cup that cheers [but not inebriates]’, refers to the value of tea drinking, a practice enthusiastically endorsed by the temperance movement in the nineteenth century. The quote became an often used automatic expression whenever tea drinking was mentioned in newspapers. Tea arrived with the First Fleet and Australians evidently were the highest consumers of tea in the world by 1900. Drinking strong Indian black tea, made in a billy can over the camp fire, became a symbol of the bush and masculinity in rural Australia. 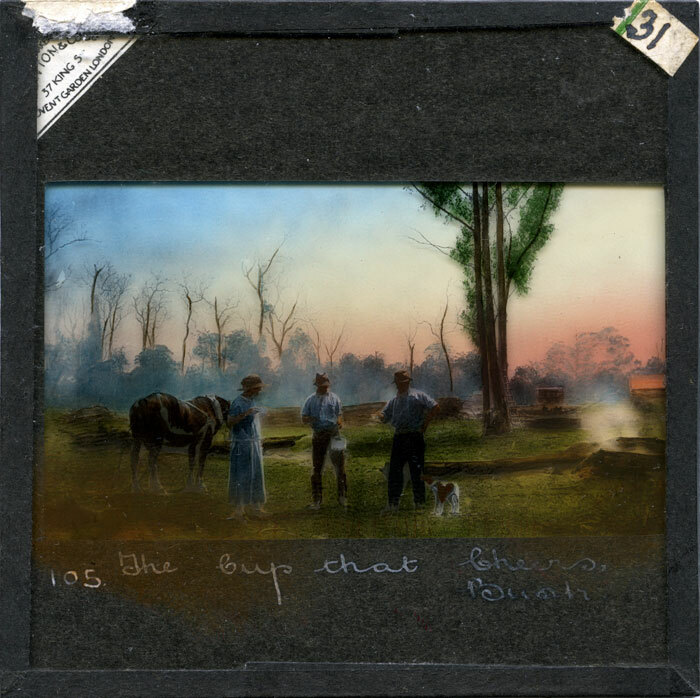 The first Australian tea company, Bushells was formed in Queensland in 1883, and Billy Tea Co. used a design of a swagman and a kangaroo enjoying billy tea. Visiting commentators noted how much tea was drunk in Australia, where it was universally popular and a social leveller. This slide comes from a Winsor & Newton set of rather nicely coloured lantern slide. Where the numbering '105' came we don't know, nor from whose specific lecture this ‘no 31’ slide belonged. What struck me, as I looked at the slide, was that it brought to mind all the nineteenth and turn of the century ‘boiling the billy ‘ associations the scene is from the 1920s. We see a well-dressed lady in a comfortable drop-waisted shift dress and decorative hat. Although she is possibly wearing sensible shoes, she appears overdressed for a casual drop-in for a cuppa in the field. She shares the billy tea in rather dainty cups, not enamel mugs; and with two blokes seemingly clearing off an additional paddock of their already established selection, as seen in the huts and sheds in the rear. Ring-barked trees are framed against the sunset as they make steady progress on land clearing and farming. Was the tea made with the traditional technique of swinging the billy can around the body to settle tea leaves to the bottom? Did she bring scones or milk? In the nineteenth century, few real 'bushies' would have had milk, but later condensed milk became popular, and is actually still unforgettable on cold camp nights. Is the ladylike visitor’s motorcar just around the corner? Maybe she is a relative from town, or a friendly neighbour from a nearby pastoral property visiting the scrub-clearing selectors. Possibly these are WWI soldier-settlers. Was the slide a completely orchestrated tableaux intended to encourage the continuance of the national myth of the bush settler that, by 1920, was largely gone and, for soldier-settler men, doomed to failure. If that is the case, the implication for this slide is that these yeomen of the bush will ascend upwards in Australia to the comforts represented by their refined visitor. It is probably Billy Tea the three are drinking. In 1903 the founders of the Billy Tea had even modified the words of Australia’s most iconic song to imprint their brand on Australia. The first verse and chorus of Banjo Paterson's Waltzing Matilda was originally: "And he sang as he looked at the old billy boiling", but in 1903 it was modified to: "And he sang as he watched and waited 'til his billy boiled...", to sound like it was Billy Tea being drunk. So the appeal of ‘the cup that cheers’ continues to this very day.